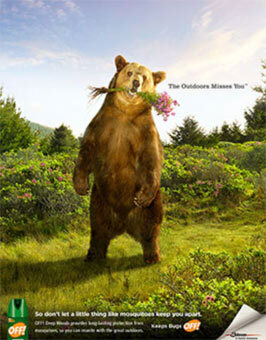 Fulvio shot in Los Angeles a real Grizzly bear in studio for a new Off campaign. The location background were shot in San Francisco area. He shot also other two ads with a falcon and a chipmunk. Agency: Energy BBDO, Chicago. Art director: Aaron Pendleton, Art buyer: Liz Miller Gershfeld, Producer: Joanne Davidson/LAH Production.